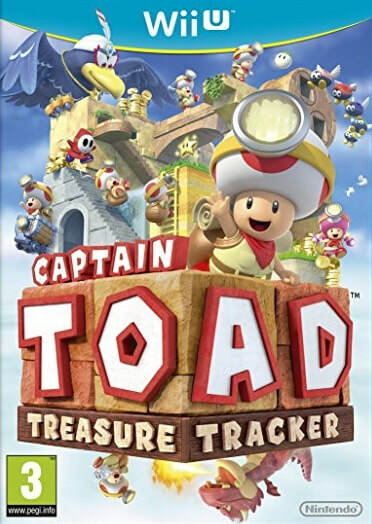 Deriving (and taking many presentation cues) from Toad’s appearance in Super Mario 3D World, Treasure Tracker is a veritable treasure trove of delightful, beautifully crafted bites of the platforming, adventuring and puzzle-solving that, in many respects, feels almost like a handheld equivalent to the Super Mario Galaxy games. 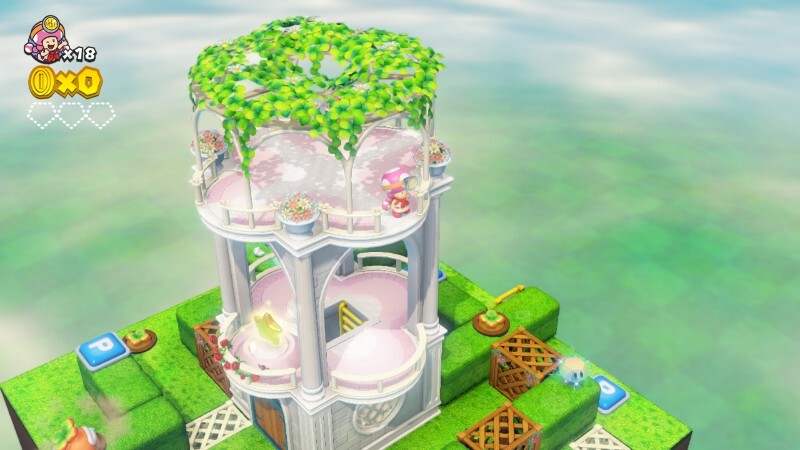 Rather than marauding around spherical worlds however, Toad and Toadette chiefly must navigate square, cube-shaped levels, often with multiple layers and routes running around them. These are typically compact, quick-fire affairs, usually lasting between one and five minutes each, though there are around seventy of them in total and, thanks to some shrewd design, there’s plenty of reasons to return. There’s a real joy to be had from exploring the smart level layouts. They’re creative, and challenging in a manner that is relatively gentle but consistent, always evolving so as to offer something different. 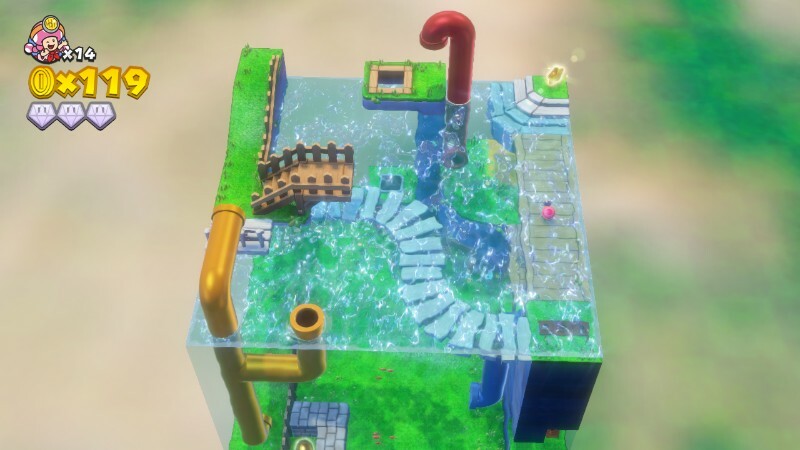 Surprisingly for a 3D platformer, there’s no jump ability, but this doesn’t hinder things in the slightest as the player must think creatively about how to utilise cannons, winches, ladders and alternative paths as a means of traversing different layers. 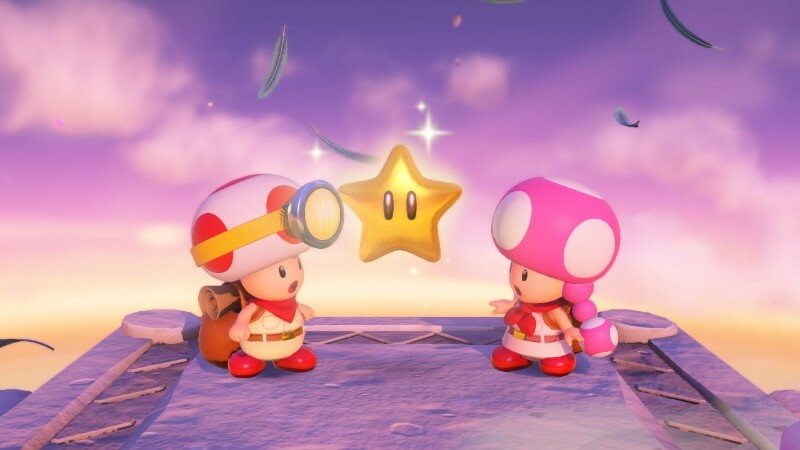 Toad and Toadette are manoeuvrable, consistent and easy to control, and there’s rarely any mishaps that you’ll attribute to the game. Imagine if lighthouses looked like this? Treasure Tracker, despite the brevity of its levels, offers a highly durable campaign, and one whose success as a game can be attributed to how effectively its replay value is structured. Completing a level, achieved by simply reaching the gold star, rarely poses a problem, but to collect the additional three diamonds that each area harbours will require more exploration than you’d first think. You’ll need a keen eye to spot those that are more sneakily concealed, whilst some require navigating more treacherous paths, and often a knack for good timing. 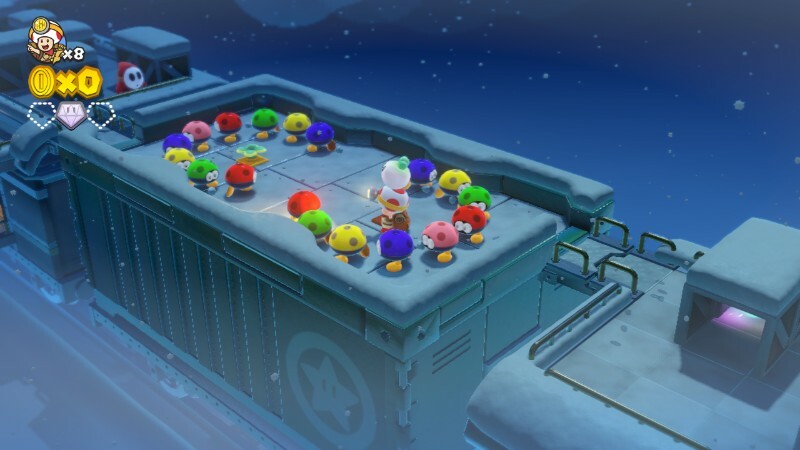 There’s also a final challenge to each level, which tests the player in one of a number of different ways, which include collecting a high number of coins, defeating all enemies, surviving a level uninjured or tackling block-shifting puzzles with a minimum number of moves. These simple but smartly-judged extras breathe new life into every level. It’s therefore easy to appreciate the quality of craft, and there’s a pleasing sense of depth and development as you seek to master them. Treasure Tracker deserves further credit for utilising the Wii U’s GamePad for something more versatile than merely playing the game on to a smaller screen. In addition, the player can move the camera through the pad’s motion giro, use its touch screen to nudge around movable blocks, and even use it as a first-person viewpoint for mine-cart sequences that act as pint-sized gallery shooter – and it works really well. It’s absolutely gorgeous looking. Bright, immaculate landscapes show of Nintendo’s penchant for primary colours in a range of beautiful locales. The super-sharp, dreamy surrounds are are a treat to behold, and from a technical level it’s almost without blemish. 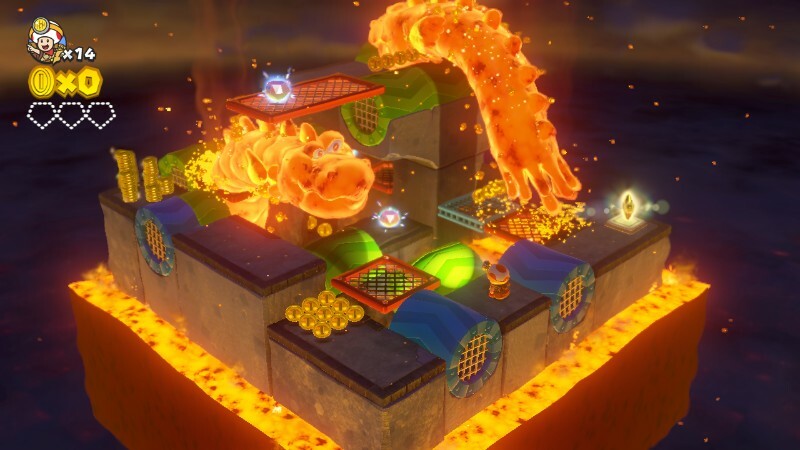 The lava levels are eye-catching, the underwater sections sumptuous, whilst the haunted house, retro, and Super Mario-inspired pipes ‘n’ greenery levels will live long in the memory. Jolly, catchy tunes make for a really good accompaniment, though Toad’s pitchy shrieks are a somewhat unwelcome reward for making progress. This fills the ed. with a sense of uncomplicated happiness. Sigh. Sometimes standing still is the best policy. Depending on where you stand. There are few downsides to Treasure Tracker. Arguably, its biggest issue lies in the slightly fiddly nature of the camera. Boss fights (or challenges) are great fun judged as a whole, but the constant need to swing the camera around so as to stop Toad becoming obscured by scenery can seem a bit of a hindrance. Whilst rotating the cube-like levels is part of the fun, it has a tendency to feel a little unwieldy during action sequences where speed and precision are paramount. 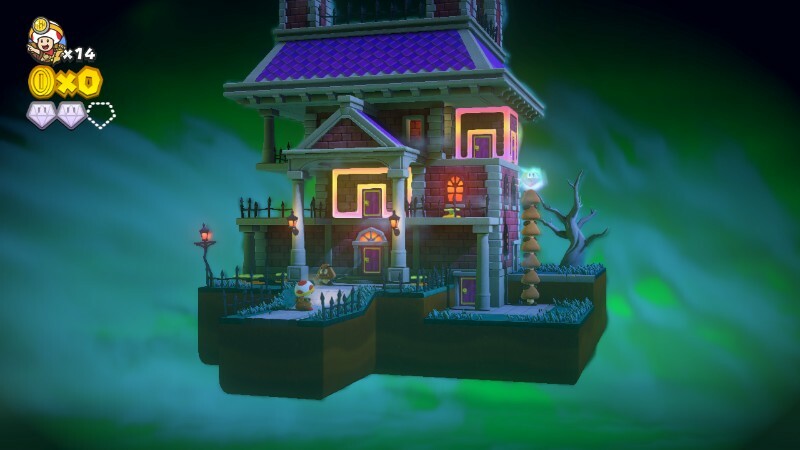 During levels such as a hair-raising dash up a haunted house as purple toxins fill the screen from the bottom upwards, as well as instances that see Toad dashing over speed strips, it’s easy to end up in situations where you can’t manoeuvre the camera around quickly enough to get a good view of where you need to be headed. It should be stressed however, that the vast majority of the time, it isn’t an issue. For fans of the Wii U, this is an essential platformer. A beautifully crafted exclusive that shows off all of the perks of the console’s architecture and features, it’s got a little something that will appeal to gamer’s of all ages. There are few games around that can claim to be as easy on the eye, and with simple, enjoyable gameplay that’s bolstered by considerable replay value, Treasure Tracker is a triumph. 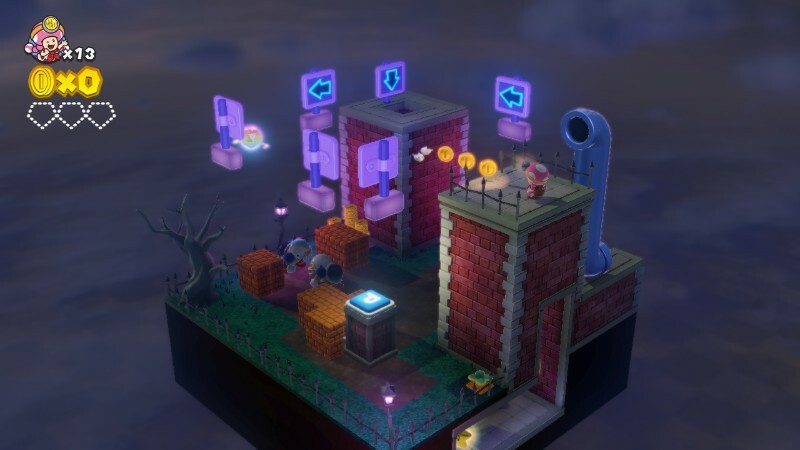 "The super-sharp, dreamy surrounds are are a treat to behold, and from a technical level it’s almost without blemish...For fans of the Wii U, this is an essential platformer."